Least PAIN & DISCOMFORT : Conventional open surgery for cancers would involve large wounds, sometime starting form top of the belly to all the way down. Cancers within the chest (like food pipe) would need opening of chest & this would be very painful (very often for life). The size of a conventional open surgery wound is a good indicator of amount of pain that it would cause (Figure). The pain after robotic or laparoscopic cancer surgery would be negligible when compared to conventional open surgery. The wounds being much smaller, hardly need any special care after surgery. Laparoscopic cancer surgery reduces the use of pain killers by about 50%. Less Blood Loss: Conventional open cancer surgery involves significantly more blood loss, very often needing blood transfusion. The precise techniques and technology used during robotic & laparoscopic cancer surgery reduces the amount of blood lost during surgery, thus improving the overall outcome of surgery. These techniques reduce the blood loss by 40 to 50% thereby reducing the requirement of transfusion. Blood transfusion involves several risks & must be avoided when feasible. Least PAIN & DISCOMFORT : Cosmetically Better Results: Very often it is argued by conventional open surgeons that cosmesis do not matter in cancer surgery. Conventional open surgery very often leaves patient with unacceptable scars that can be avoided with robotic or laparoscopic cancer surgery. The scars over cosmetically sensitive areas like face and neck are unacceptable for most and can affect curriers and life. 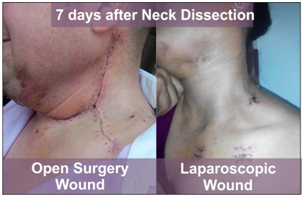 Cosmesis in cancer surgery means preservation and restoration of physical appearance. This happens without changing the cure rate. Short Hospital Stay & Quick Return To Normal Life : A major surgery would mean a long stay at hospital & a prolonged time for recovery. Following robotic or laparoscopic cancer surgery, the internal organs recover quicker; the wounds heal faster & patient starts feeling healthy much earlier. Patients undergoing robotic or laparoscopic cancer surgery return to normal life and activity much earlier than patients undergoing conventional open cancer surgery. This reduces the hospital stay by about 30 to 50%, thus reducing both the cost of hospital stay & professional losses. Least PAIN & DISCOMFORT : Least Wound Related Complications: : Smaller the wound, lesser the wound related problems. The wounds of Robotic & Laparoscopic Cancer Surgery are tiny when compared to large wounds of conventional open cancer surgery. 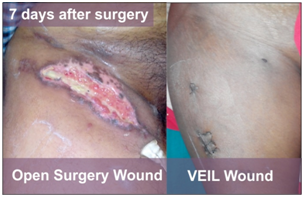 Large wounds have higher risk of infection & other wound related problems. Some areas of body, like groins, are much more prone to wound related complications. This would need prolonged wound care & may even need further surgery. These problems are unseen with Robotic or Laparoscopic Cancer Surgery. Chronic wound pain is common with large wounds of abdominal (belly) & chest surgeries. These are difficult to treat & last lifelong. Robotic & Laparoscopic Cancer Surgery completely eliminates this as it avoids large wounds & places wounds in less painful areas. Hernias of the wound are another complication needing surgery to repair them. Larger wounds have higher risk of hernia. Avoid Unnecessary Major Surgery: Laparoscopic Cancer Surgery is a great boon to cancer patients. 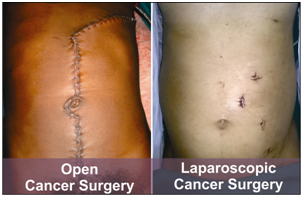 During conventional open surgery many a time’s cancer is found to be beyond cure by surgery (inoperable). This leaves the patient with a large wound that takes time to heal. These patients can go for further treatment (radiotherapy or chemotherapy) only after the wound heals. Unlike this, every robotic or laparoscopic cancer surgery starts with a diagnostic staging laparoscopy. With this the surgeon can assess the status of cancer better, stage it more accurately and decide about the best treatment. If the cancer is found inoperable, unlike open surgery, patient is left with tiny wounds and next treatment (radiotherapy or chemotherapy) can be started from the very next day. Get Advantages of ROBOTIC surgery: Laparoscopic cancer surgery is technically challenging for surgeons. There are some surgeries which are challenging for even an expert laparoscopic cancer surgeon like Dr Nayak. A surgical robot helps in performing these surgeries by providing help in various forms (3D vision, robotic wrist, etc.). Robot adds a lot to the comfort of the surgeon in performing complicated surgeries. As far as patient benefits are concerned, robotic cancer surgery is marginally less painful than laparoscopic surgery. However, when a good surgeon uses the help of a robot, the precision of surgery is far better thus benefiting the patient. Best Possible Cure Rate: Only surgery can cure most of the cancers. So, a well performed radical surgery is the key to cancer cure. Additional therapies like chemotherapy & radiotherapy are useful only to improve the effects of surgery. It has been convincingly proven by many studies that robotic or laparoscopic cancer surgery is feasible and as effective in curing cancer as conventional open cancer surgery. In some cancers the outcomes are somewhat better than for laparoscopy than for conventional open surgery (e.g. colonic cancer). So, why choose conventional open surgery or robotic surgery when you can get all these benefits and more!